Hamas is widely expected to win control over most of the local governments in Judea and Samaria. Hamas’s coming takeover of the municipalities is likely playing a role in decisions by Fatah terrorist cells to reject the authority of the PA. Many of those cells can be expected to transfer their allegiance to Hamas once the terrorist group wins the elections. 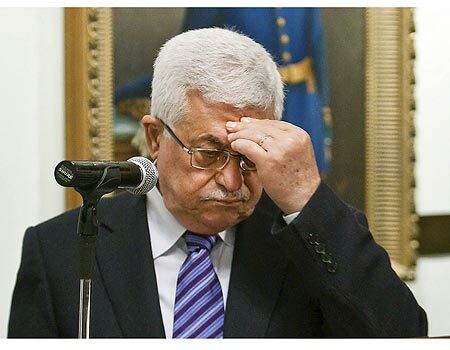 Given his Fatah party’s looming electoral defeat, more and more PA functionaries are wondering why Abbas doesn’t use the growing anarchy in Palestinian cities as a reason to cancel them. Abbas seems to have calculated that Israel will step in and, as it has repeatedly done over the past 20 years, cancel the elections for him. Media organs Abbas controls are full of conspiracy theories whose bottom line is that Israel is not canceling the elections Abbas declared because it is in cahoots with Hamas and other “collaborators” to undermine the PA.
Defense Minister Avigdor Liberman’s recent announcement that Israel is adopting a carrot-andstick approach not toward the PA but toward the Palestinians themselves, and will advance development projects in areas where terrorism levels are low and take a hard line against areas where terrorist cells are most active, has sent shock waves through Abbas’s palaces. For 22 years, Israel has bowed to Palestinian and Western demands and agreed to speak only to PA functionaries and Palestinian civilians authorized by the PA to speak to Israelis. Liberman’s decision to base Israel’s actions on the ground on the behavior of the Palestinians themselves rather than act in accordance with PA directives, along with his decision to speak directly to Palestinian businessmen and others, marks the end of Israel’s acceptance of this practice. Without a doubt, Israel’s willingness to let Abbas fall is in part a function of the wider Arab world’s increased indifference to, if not disgust with the Palestinians. As MEMRI has documented, the Arab media is registering growing impatience with PA spokespeople. Arab commentators have harshly criticized PA functionaries who continue to insist their conflict with Israel is the most pressing issue on the pan-Arab agenda. The disintegration of Syria, Iraq, Yemen and Libya and the rise of Iran as a mortal threat, along with Israel’s growing importance as an ally to Sunni Arab regimes have made the Palestinian cause look downright offensive to large swaths of the Arab world. Part of Israel’s willingness to let Abbas fall also owes to its inevitability. Once Hamas wins the elections and takes control over the local governments, Abbas’s already weakened position will become unsustainable. As is already happening in towns and villages throughout the areas, Fatah cells will transfer their allegiance to Hamas. The areas will become Balkanized and radicalized still further. Moreover, this process will likely be rapid. Just as Hamas’s complete takeover of Gaza from Fatah forces happened seemingly overnight in June 2007, so its seizure of control over Judea and Samaria will happen in the blink of an eye. The collapse of the 'Palestinian Authority' and the likely end of the 'two-state solution' are also part of Barack Hussein Obama's disastrous foreign policy legacy. It's been more than seven years since 'Abbas' told the Washington Post's Jackson Diehl that his only role in the 'peace process' was to wait until President Obama forced Prime Minister Netanyahu to give him what he wanted. Yet on Wednesday afternoon, as he prepared for the White House meeting in a suite at the Ritz-Carlton in Pentagon City, Abbas insisted that his only role was to wait. He will wait for Hamas to capitulate to his demand that any Palestinian unity government recognize Israel and swear off violence. And he will wait for the Obama administration to force a recalcitrant Netanyahu to freeze Israeli settlement construction and publicly accept the two-state formula. So why is that Obama's fault? Because instead of taking 'Abbas' to task for his recalcitrance, Obama and his two Secretaries of State pandered to the 'Palestinian leader,' continuing to pressure only Israel to make concessions. Abu Mazen read that correctly seven years ago, and he still reads it correctly today. What's interesting about Abbas's hardline position, however, is what it says about the message that Obama's first Middle East steps have sent to Palestinians and Arab governments. From its first days the Bush administration made it clear that the onus for change in the Middle East was on the Palestinians: Until they put an end to terrorism, established a democratic government and accepted the basic parameters for a settlement, the United States was not going to expect major concessions from Israel. Obama, in contrast, has repeatedly and publicly stressed the need for a West Bank settlement freeze, with no exceptions. In so doing he has shifted the focus to Israel. He has revived a long-dormant Palestinian fantasy: that the United States will simply force Israel to make critical concessions, whether or not its democratic government agrees, while Arabs passively watch and applaud. "The Americans are the leaders of the world," Abbas told me and Post Editorial Page Editor Fred Hiatt. "They can use their weight with anyone around the world. Two years ago they used their weight on us. Now they should tell the Israelis, 'You have to comply with the conditions.' "
That is why for the past seven years, nothing has happened with the 'peace process.' And that is why nothing will happen during Obama's remaining months in office. Obama only knows how to pressure one side, and the Democratically elected government of Israel has a much better ability to resist Obama's pressure than does Abu Mazen, in his 11th year of a four-year term. At this point, as Caroline Glick notes above, there are more reasons for peace not to happen than there were seven years ago. The Arabs don't care about the 'Palestinians' anymore. They are busy with their own. If there was an opportunity for peace during the past seven years, it was surely missed. And that is Obama's legacy to our region. They claim to want a state. Ok fair enough. They 'elect' whatever they like to lead them. Again, so what. That doesn't translate into anyone else having to deal with them .